Bonhams will have an auction on June 20th to sell Mike Oldfield's Fender Telecaster serial no. 180728 which was the only six-string electric guitar used to record 'Tubular Bells'. It's estimated between £25,000 and £35,000 that will go to the charity SANE. This is more like it, a proper sale, as opposed to Ebay and all that jazz. Hopefully it'll stay in the UK and be put on show so we can go and visit it. Or better still will appear on stage with some great (not necessarily famous) guitarist. Well Ray, how about it this time? Is this the Fender Telecaster which was given by Mike's agent when he was with Kevin Ayers and the Whole World? I'm so glad Mike's Telecaster going to be sold in a proper auction, rather than that e-bay fiasco last year. Pity i haven't got a spare £25-30,000 knocking around , I was tempted to buy a blonde Telecaster last year I think it was £599 in a music shop in Canterbury, but I didn't have enough cash again. I just love Telecasters. I'd love to see Mike's Tele go to a fan. Good on ya Mike . It's amazing or worrying to think that 1 in 4 of us will suffer from some form of mental health problems at sometime in our lives. Yep I'm challenging the misconceptions about mental health. Hopefully it'll stay in the UK and be put on show so we can go and visit it. Or better still will appear on stage with some great (not necessarily famous) guitarist. Somewhat selfishly (being from the UK too) I agree. Wouldn't it be good if it went to someone from this forum. Maybe, it will come to Switzerland! well my boss at work is a multimillionaire but he won't buy it (yes I asked) and it's too expensive for me. I'll make do with MIke's old Ramirez. Yep - I'm already on to it. What I do care is the fact the money is going to charity,and help people who needs care in terms of pyschological problems like Mike did in the past. I agree Tati, there's a shortage of psychological services on the NHS within the UK , speaking from experience myself and many friends talking therapies really work . That said I've had confirmation today that I've been accepted on a course for a "Certificate in Psychodynamic Counselling" WHOHOOOOOO !!!! Counselling is something I've wanted to do for years . Sorry if I've gone slightly off topic there, back to the topic of guitars I've an "Aria Pro II Magna Series MA 20" eletric I've had since 1990 in need of some TLC I've had 16 years, but I think now it looks a bit "Heavy Metal" , I love Fender Telecasters , saw a Tele in a music shop in Canterbury last year , wish I had £599 to spare, plus the cost of an amp, the Tele was beige with a white pick guard , like the one owned/played by Keith Richards , I must admit I fell in love, no way could I afford Mike's Tele unless I had a lottery win. 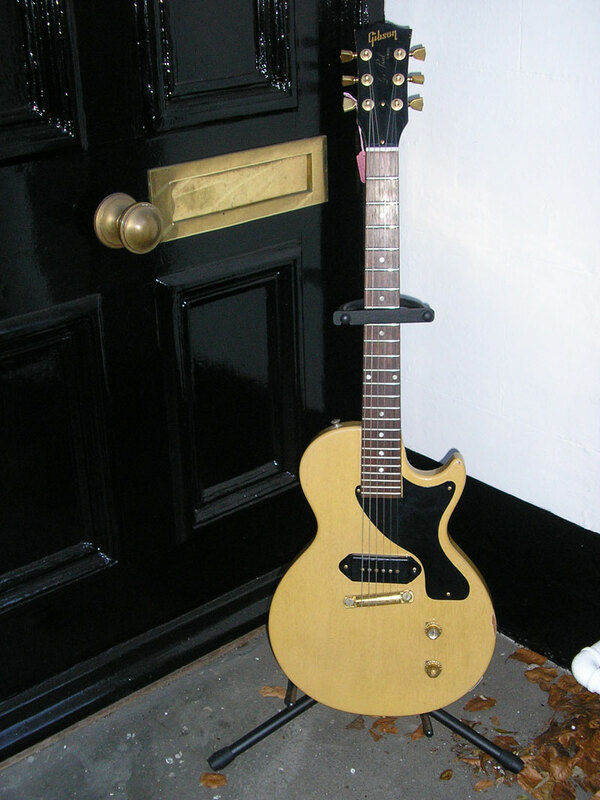 But a guitar used by Mike Oldfield to record Tubular Bells failed to sell. The Fender guitar - previously owned by Marc Bolan - had been expected to fetch £25,000-£35,000 at the sale. The guitar has been donated by Oldfield to be sold on behalf of the mental health charity Sane. Mike should just keep the guitar for himself, he is donating lots to SANE already with the sale of his book. Either that or raffle it off to the fans, say for £25 a ticket. its a shame, it would have been good for Mike to sell it this way. Probaby the lack of any US interest pulls the price down a bit. I would love to play it just to ...well, play it. Just once. Someone should buy it and rent it out! OK - I need to contact Mike's management team. I want to buy that guitar I put a bid in but they obviously ignored it. I need a phone number NOW - if possible. does anyone know what the number is!!!!!!!!! !